Yes, there is a sun. This morning dawned early, with some very loud birds at about 5 am. I finally dragged myself out of my sleeping bag at 6 am, happy for the brief chance to visit with Nancy before she left for work in the morning (she takes the 6:45 am ferry). In order to ensure her spot, Frank drives their vehicle down to the ferry lineup just after the 5:45 am boat leaves. The ferry is a short 5 minute walk from the house, so as long as he gets a close spot (they don’t have a ferry parking lot, so the lineup can extend a few km up island) Nance can walk to the car just before the ferry arrives. This gives her an extra 30 or so minutes at home in the morning before leaving for work. My body is doing remarkably well given that yesterday I rode my first metric century (100 km) on my new bike, loaded with gear! This bodes well for the days to come. We made it to Southwich Beach state park, which is about 75 km from where the Wolfe Island Ferry drops you off. It was a good day from a distance perspective, but not from a sunburn perspective. When we finally stopped for lunch (about 2 pm), we discovered that both of us had burned arms, despite fairly fanatical application of sunscreen. 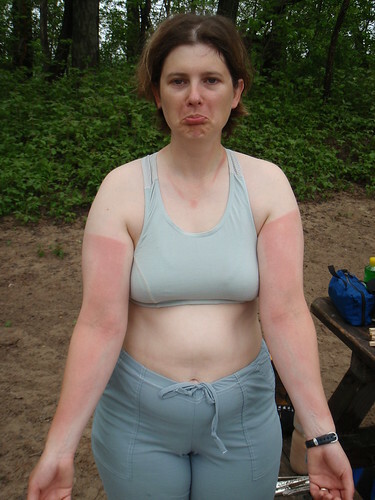 The funny thing with a recumbent is that you burn on the underside of your arms rather than the tops. As a result of our sunburns, we’ve purchased some different sunscreen, as the stuff we were using didn’t work all that well. Also, we’ll add applying sunscreen as part of our morning yoga ritual, such that we are each assisting the other. The burn on my neck is largely because I applied my own sunscreen, so I’m hoping with Scott’s help, I won’t have any missed spots! 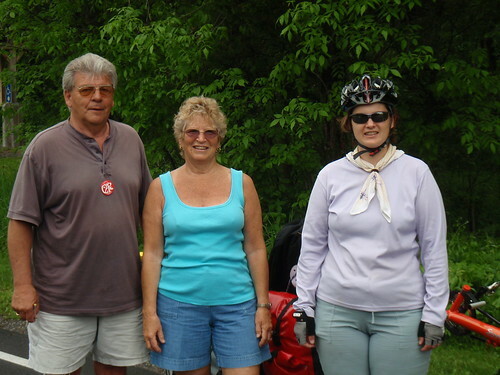 We met Tom from Watertown that cycled the Southern Tier with Adventure Cycling a couple of years ago. He gave us some advice on where to find food and which were the nicer campgrounds. Pulling into the campground was eerie to say the least. The enter campground looked abandoned. The main office had a sign that said, “Please pick a vacant site and pay in the morning”. It looked to us that all the sights were vacant. After a little further searching we found the campground area where everyone was – the beach front sites. The sites are just over ½ full with all but 2 sites (us and one other) that have RVs or camper vans. The rain held off until just before supper. Fortunately, we had some grumblings of thunder to warn us, so we moved dinner preparations to underneath the concession station. We were nicely covered when the skies opened up. While we were finishing our dinner waiting for the rain to stop, Claude the camp host and his entourage stopped by (his wife Janet, and friends Bob and Dianne) we had a long chat, mostly about our trip.